These problems are clearly having negative impact on both uptake and usage, not only in the three countries mentioned, but elsewhere in the developing world. Non-users and users alike look at the customer experience and worry about how reliable and trustworthy digital financial services really are. The problems are also well known to providers, and so in this post I examine why they often struggle to address and resolve these challenges – even when they are so clearly negatively affecting their business. Service downtime appears to be a purely technological problem that should be relatively easy for providers to address. However, there are several challenges that underlie this and make it a much more complex problem than it appears. First, in many markets DFS requires the systems of multiple institutions (mobile network operators [MNOs], banks and third-party agent managers) to talk to one another. In these markets it is often difficult to pinpoint where the bottlenecks are, and with regulatory authorities taking an increasing interest in system availability, institutions are unlikely to admit when their systems are causing the downtime. Unsurprisingly, MicroSave has seen several markets where multiple players are blaming one another for service downtime. Second, if one or more of the institutions in the value chain do not receive adequate compensation for providing the services, they are unlikely to invest additional bandwidth to resolve the problem. Indeed, in some cases, players in the value chain may simply ration bandwidth availability on their systems. In Bangladesh, a typical cash-out transaction has five to six stages. If the customer is not able to complete all five to six stages within the 90-second time limit allocated by mobile network operators (MNOs), the session lapses and the transaction fails. Customers perceive this as a service downtime; however, it technically happens because of the session lapse. Third, as Fionán McGrath & Susie Lonie noted in “Platforms for Successful Mobile Money Services,” the first wave of providers, unsure of the likely returns from mobile money, underinvested in the systems to manage DFS. Providers not meeting their return on investment targets, or at least clearly on the way to doing so, are unlikely to sanction additional capital funds to upgrade their systems. But those that do should, if MTN-Uganda and Ericsson are to be believed, be able to make very significant improvements in the availability of their systems. 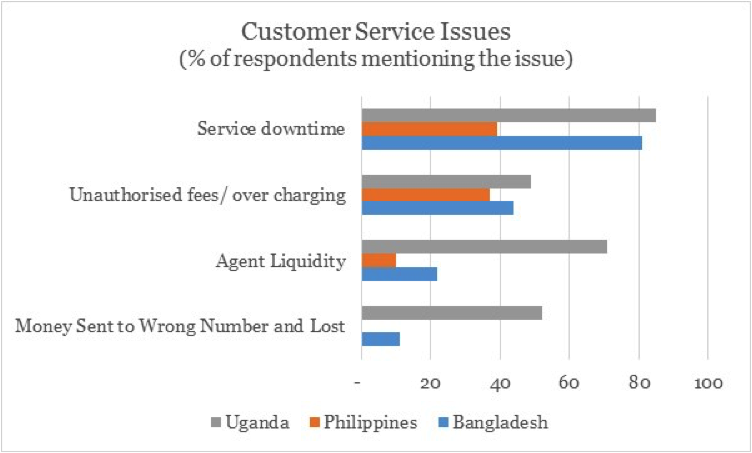 Finally, MNOs in Uganda note that agents without liquidity prefer to mollify their customers by telling them that “the system is down” rather than having to explain that they cannot conduct the transaction for want of usable funds. This may be common in other markets too. Without regular and rigorous mystery shopping, providers are likely to struggle to counter this problem. Charging of unauthorized fees/overcharging is quite common but occurs for a wide variety of reasons. In the Philippines, different agents charge different commission rates depending on the agreement they have reached with the provider. This is designed to allow rates to be competitively determined according market conditions – and thus permit those agents operating in hard-to-reach and thus service-remote areas to charge more than those in urban areas. The different commission rates (theoretically ranging from 1-5 percent, but in reality are in the 2-3 percent range) leave many consumers with the impression that some agents are overcharging. Providers wishing to address this would have to conduct an extensive above-the-line communications campaign with a complex core message. In Bangladesh and Uganda, as in many markets MicroSave has observed, agents (again, particularly those operating in remote rural areas where they have a quasi-monopoly) often charge additional unauthorised fees on top of the often undisclosed “on-the-board” rate. This practice is especially common, and indeed accepted by many customers, for over the counter (OTC) transactions, where the agent is seen to provide a valuable service and to reduce risk by conducting the transaction. Addressing this, particularly in the context of agents’ incentives to foster OTC transactions, is likely to be a real challenge for providers. Again, mystery shoppers and regular monitoring of agents by providers’ staff or third parties hired to do so, as well as a quality customer care call centre, can address this challenge. Agent liquidity is consistently the “hot topic” at The Helix training sessions on agent network management; all types and sizes of agent network managers seem to struggle with this. PEP Intermedius, a network of cash merchants that serves as the bridge for unbanked customers and the financial system, is one example organization aiming to remedy it. PEP’s float management system in Kenya is extremely popular. Meanwhile, Bangladeshi providers, led by bKash, have some of the most successful and sophisticated agent liquidity management systems that involve the delivery of liquidity to agents on a daily basis. These systems have been designed and implemented in the context of Bangladesh’s very high agent and population density, but could potentially be replicated in urban areas of most countries. First Rand Bank’s agent management system in Mumbai combines elements of these with credit for agents to allow them to hold higher levels of liquidity. For more rural areas, providers will need to look at new approaches to helping agents predict their liquidity needs better. The fear, realised or not, of losing money by sending it to the wrong number is very real in both Uganda and Bangladesh. Indeed, this fear is encouraging people to ask agents to conduct transactions for them – and thus an important driver of the growth of OTC transactions. For SMS-based systems this problem can be addressed relatively easily by linking the sender’s address book to the mobile money system (implemented in Kenya by M-PESA), so that the recipient’s name is displayed for each transaction. For USSD-based systems there at least three potential solutions, all of which present different challenges. The first (implemented in Uganda by Airtel) is to use the registered customer base to display the recipient’s name once the phone number is entered. This, of course, requires a comprehensive and accurate database of all customers, and (where there is inter-operability) will not work for customers registered on other providers’ systems. The second (implemented in Bangladesh by DBBL and GrameenPhone’s MobiCash) is to use a check-digit system under which every mobile number is assigned an additional digit based on an algorithm. As a result, if a wrong number is punched in, the transaction does not go through. The third, requiring the sender to enter the recipient’s number twice, prolongs the transaction and thus undermines the customer experience. Since agent illiquidity and the charging of additional unauthorised fees are increasingly accepted as the norm in many markets, customers with substantive problems most commonly call customer care when they have transferred money to the wrong number. DFS providers have consistently struggled with repudiation (see “Fraud in Mobile Financial Services” page 23), and have typically adopted a policy of “repudiation only with consent of both parties.” As a result, customer care typically can do little to help customers resolve this issue. However, clearly defined and well communicated policies on repudiation, as well as free calls to better-trained customer care centres, can do much to improve this. It is clear that these customer service issues need to be high on the agenda of providers intent on achieving high levels of registered uptake and usage of DFS. It is also clear that responding to the most common challenges is no easy matter, even for the most committed provider. Improving customer service, and thus the customer experience, will require investment in systems, communication, monitoring of agents and in the call centres that support customer service. In the long run, basic payment services, particularly when delivered as OTC services, will limit the profitability of DFS for providers – see GSMA MMU’s Mobile Money Profitability: A Digital EcoSystem To Drive Healthy Margins. So quite apart from the risk of the regulators turning their rhetoric (and, in many cases, existing regulations) into action, providers focused on the long-term profitability of their services need to address these core customer service issues sooner rather than later.